Hello. My name is Mike and I’m hooked on sight casting. Since my first attempt at sight casting several years ago I have become hopelessly addicted to what I consider the most challenging and rewarding style of fishing the Texas coast has to offer. I consider my guide service something of a floating therapy center for fly casters and light tackle enthusiasts who share in my addiction. As the name implies, in sight casting, a cast is not made until the angler sees a fish or group of fish. In this sense it is closely related to hunting. Often compared to bow hunting, sight casting requires stealth, nerves of steel, and a quick, accurate “shot” or cast. For the angler who has progressed to the point where the “sport” is more important that merely filling the cooler with fish sight casting can be the next step. I no longer measure the success of a fishing trip by the number of fish caught, but by the number of fish seen. 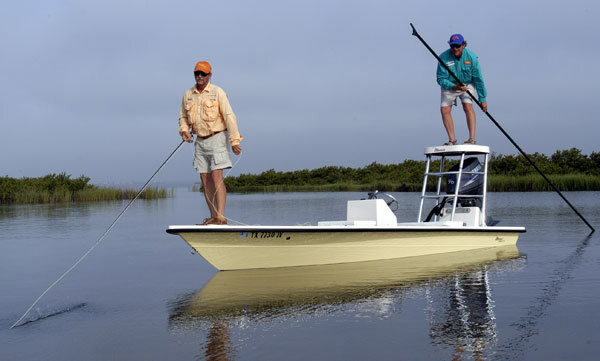 For the trip to be successful I want to show my clients at least 50 redfish in a day. 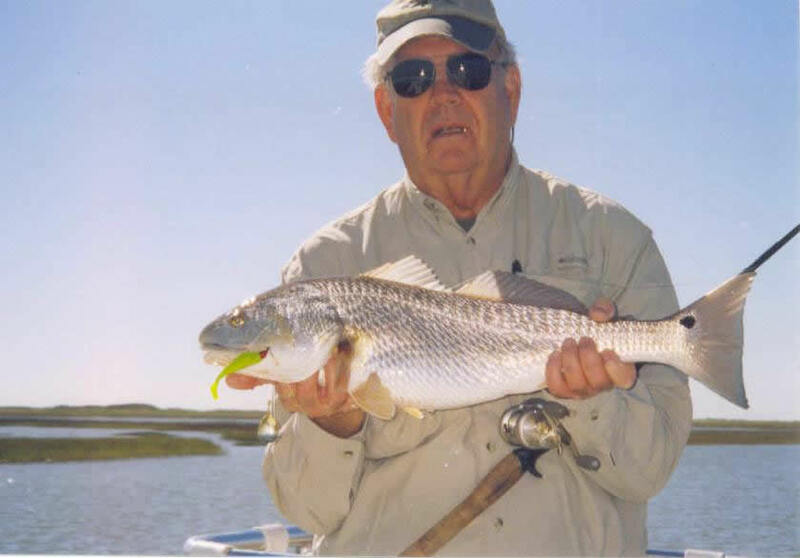 I will do my best to get the angler in an area of clear, shallow water where redfish feed. While silently poling my flats boat along a shoreline or grass covered flat, from my elevated platform, I scan the area looking for our prey. If we are lucky we’ll find reds tailing. Tailing fish are the easiest to see and normally are actively feeding. Otherwise I focus on the bottom, not the surface of the water, searching for that beautiful bronze color or maybe just a fin or blue tipped tail. Sometimes it’s just a shape that doesn’t fit the scene. Once the fish is spotted I tell the angler where the fish is related to the clock and distance. The bow of the boat is always 12:00. Therefore a fish at 11:00 and 30 feet is just a little left of directly in front of the boat and 30 feet away. From this point the challenge is in the hands of the angler. He must make a quick accurate cast to the target. The target is not the fish. The last thing you want to do is hit the fish with your lure or fly. Depending on the conditions, the target is a few feet ahead of and a few feet beyond the fish. This allows you to make the cast without spooking the fish and then work your lure or fly to the fish. Sounds easy enough but it’s not. Several factors affect the situation. The boat is moving, the fish may be moving, the wind is blowing and you are probably a little nervous or excited. You must calm your nerves and adjust to all the other factors to take advantage of the opportunity. A well placed cast and the proper twitch of the lure or strip of the fly can result in a heart stopping strike at your offering. Your rod bows and the line screams from your reel as the red rips across the flat frantically swimming for freedom. The rush you experience is incredible as the adrenalin runs through your veins. In short order the fish is brought to the boat and the fight come to an end. You take a few moments to relax and snap a few photos. Now let’s do it again. By the way you might as well call for another therapy session because now you are hooked too.